So following on from last weeks newsletter, I’m gonna stay in the kitchen…. Now that you’ve done the leg work, or got someone else to do it for you, you need to consider the functionality of the kitchen and how it is going to work for you. 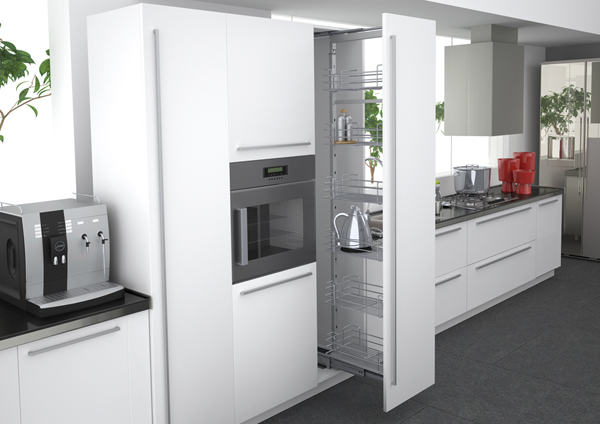 There are lots of functional interior fittings that will help maximise the space of your kitchen, but they are costly and you don’t need to have every gadget on the market. So we have looked at some of the options out there to try and help you narrow down the options….. 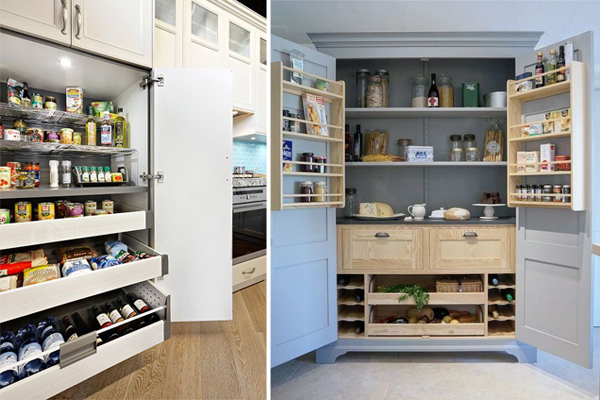 The Larder used to be something that we would associate with our Grannies houses, but not anymore. The Larder has come back with a bang, and lets be honest, is one of the most useful spaces in the kitchen. If you have the space, then I would definitely consider a large double press, with a purpose designed interior. Here are 2 really nice options…. If you don’t have the space, then why not consider the single door option. 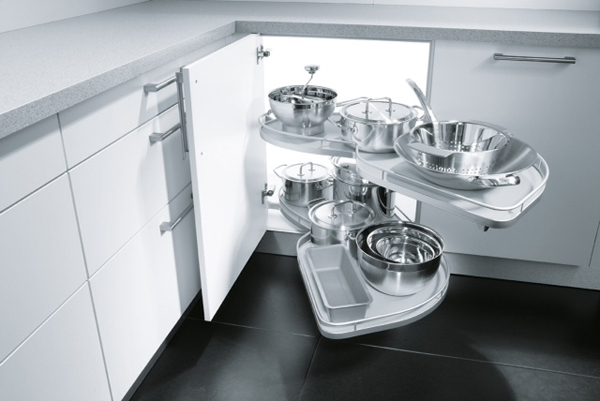 These generally come in 400mm and 600mm options, depending on your kitchen space. I recently upgraded to one of these and I have to say, I love it!!!! I’m pretty sure that we can all remember a time when we had to reach into the back of the awkward press to find something, and everything fell out on top of us. Well there are now some fantastic solutions….. Depending on what you intend to store in your corner press, you have a few options, there is the fly moon corner pull out (above). This works really well for pots and pans, etc. 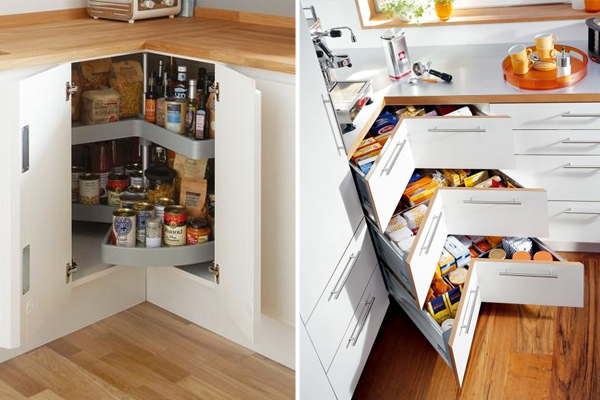 If you are storing smaller items or dry goods then the corner carousel or angled drawers is the way to go. 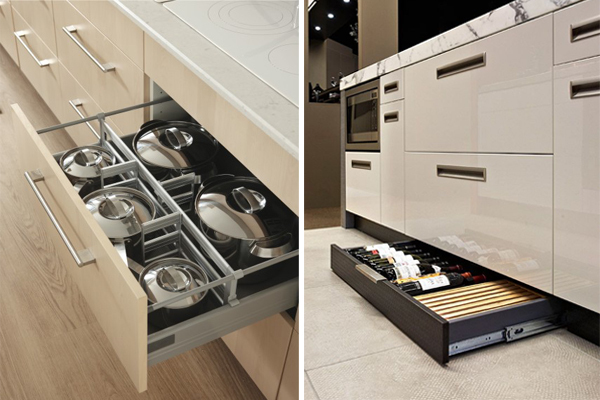 Most kitchen companies will have the option of adding extras, such as drawer organisers, and you can pretty much get one for nearly everything that you put in a drawer. However, they can really bump up the overall cost of your kitchen. 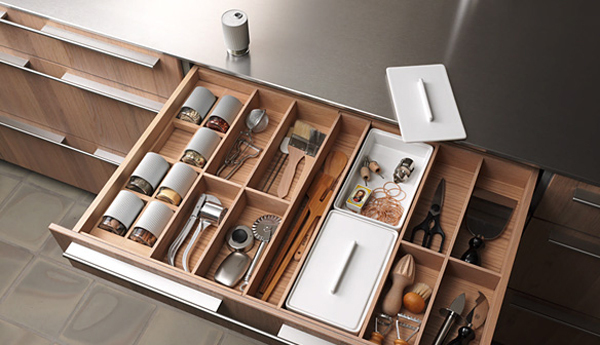 Ikea have a great range of drawer organisers, so it might be worth checking them out first. Well, you have to admit that you don’t see this very often….. 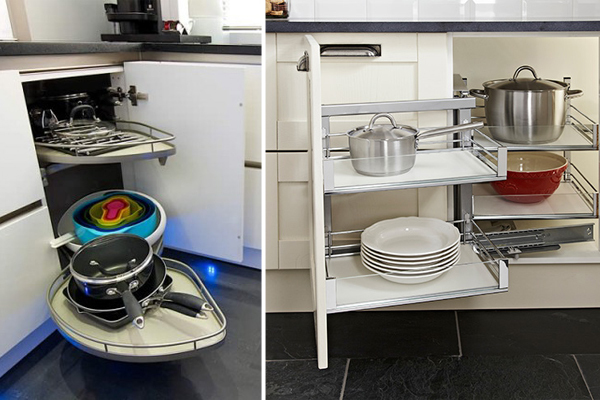 The space underneath our kitchens is effectively dead space, so kickboard storage is a great way to maximise this space, particularly if you are working with a small kitchen space. 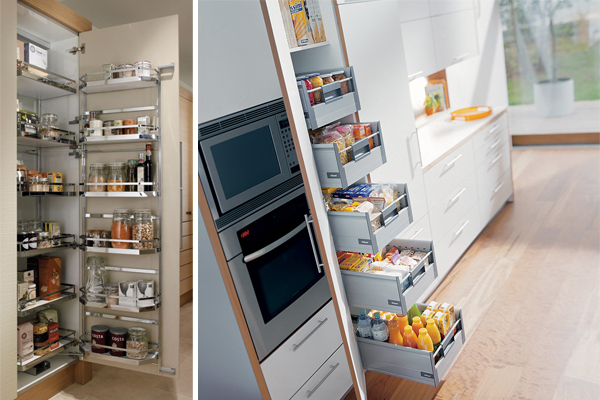 If you are in the process of selecting a new kitchen, then hopefully some of our suggestions will be of use to you.